The flag of the Serbian Orthodox Church is the Serbian tricolor with a golden cross and four elements called očilo. Proportions vary, but the most frequent of them is nearly 1:4. Ocila is the term that describes the four C-shaped elements. Another word in Serbian for the same thing is ognjila, but I do not think that this is ever used for those elements in this sense. Ocila is called in English a firesteel. A similar device is also known in West-European heraldry, there most usually with opening above, often with fire bursting from it. The meaning and use of this symbol is said to date back to the XIIIth century during the life of St. Sava, a Serbian prince, monk, and a patron of the Serbian Orthodox Church [est. 1219]. During that time of transition in Serbian medieval history, the state was pressured by the Vatican to convert into Catholicism. Since the state did not have its own independent ecclesiastic establishment, St. Sava called for establishment of Serbian independent Archiepiscopat, and as well called on all Serbs to unite against the pressure from The Vatican. St. Sava said, 'Only Unity Saves the Serbs', in Serbian, Samo Sloga Srbina Spasava. Every word in that sentence begins with the letter S; in Cyrillic alphabet letter S is С, and there comes the explanation why there are four C's in the Serbian coat of arms. 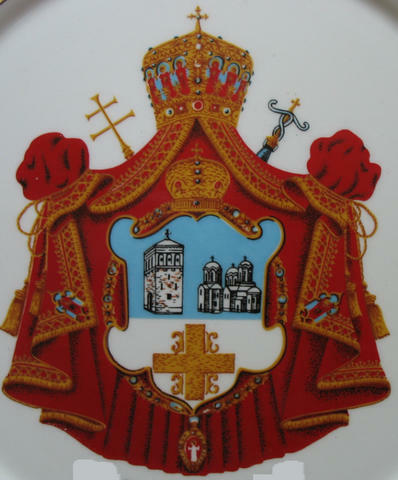 The Serbian coat of arms represents a reminder for a need for Serbian people to unite with the cause to preserve their heritage and nationhood. Before the XIIth century, an almost identical cross with four C- or rather B-shaped firesteels was used by the Byzantine Paleologue Emperors, the letters standing for the Emperor's motto: Βασιλευς Βασιλεων Βασιλευων Βασιλευσιν, that is, King of Kings, ruling over Kings. In the Orthodox Church, the cross that has been seen by Constantine the Great (270/288-337) is a very important symbol. Before the battle at Saxa Rubra (Milvian Bridge) he is said to have seen in the sky a very bright cross ("bright as many stars"). The message that he's been heard was: In hoc signo vinces. There is a difference between this cross of victory (Constantine won the battle) and the cross of crucifixion. In addition, it is also a representation of the bright cross they believe that will appear in the sky at the end of the World (Matthew 24:30). There are several different ways to represent brightness of that cross. One of them is with diagonal rays, the second is with the Greek letters IS HS NI KA (Jesus Christ is victor). The third way is with four firesteels. The cross with four firesteels is an old Byzantine/Orthodox symbol and should not be connected to the Paleologues (the last ruling family). It has nothing to do with four Β (Greek or Serbian Cyrillic alphabet). 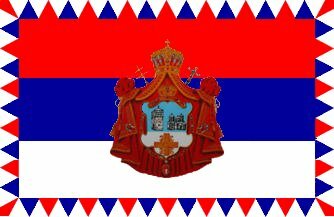 The Serbian Orthodox Church Patriarch Flag consists of the coat of arms on a red-blue-white tricolour, with a border of red, blue and white triangles. The flag was seen at an event in Belgrade. I have also found this flag a couple more times (even in the USA). I did some research and found out that Serbian flag with SOC coat of arms in the middle is Patriarch's flag. I've seen also that some SOC dioceses are doing a similar thing by putting the diocese coat of arms on the Serbian flag. Are you certain that the flag you saw had a border of colored triangles? This question has come up before- the photo at http://www.spc.org.yu/Vesti-2004/05/dvaveka-15f-v.jpg and http://www.spc.org.yu/Vesti-2004/05/11-5-04-e.html (official website of the patriarchate) shows the border as colored squares instead of triangles. Yes those where triangles, although I have seen one with squares too. Actually, I think that flag with R-B-W squares, is flag of the building of the Patriarshia. The one with triangles is a rank flag for the Patriarch.